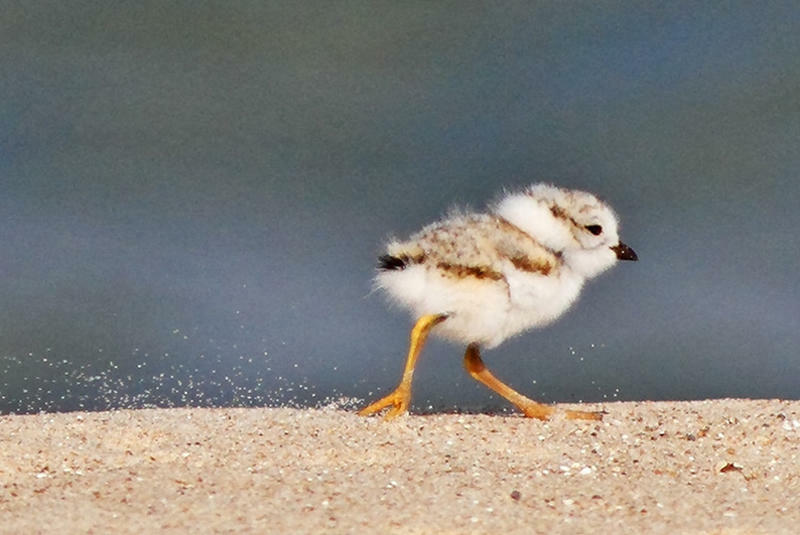 Piping plover chicks can run around within hours of hatching, but take about 23 days to learn how to fly. Merlin in morning light photographed in Jamestown, RI. 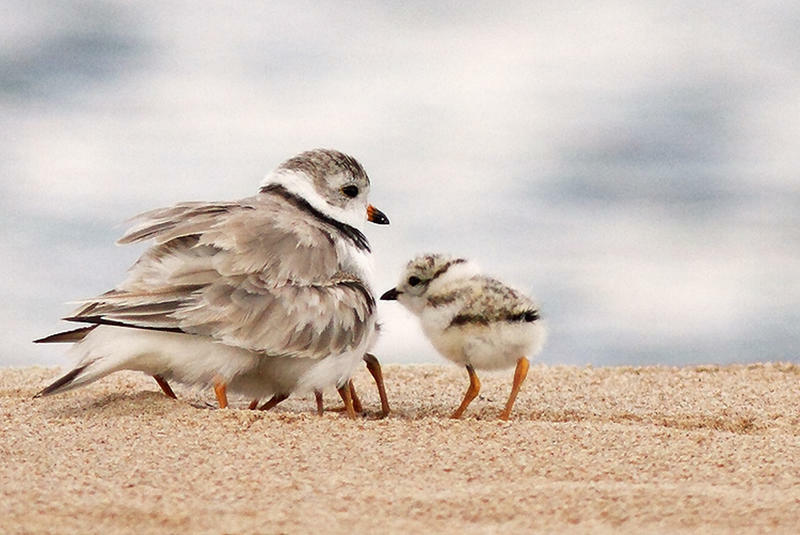 Piping plovers are on the federal endangered species list. Saunders says there were just 12 breeding pairs left in our region back in 1990. Now, there are 75. But in a new study in the Journal of Applied Ecology, she found the birds could end up doing worse over the long run. That’s mainly because of a bird that loves to eat plovers, called the merlin. 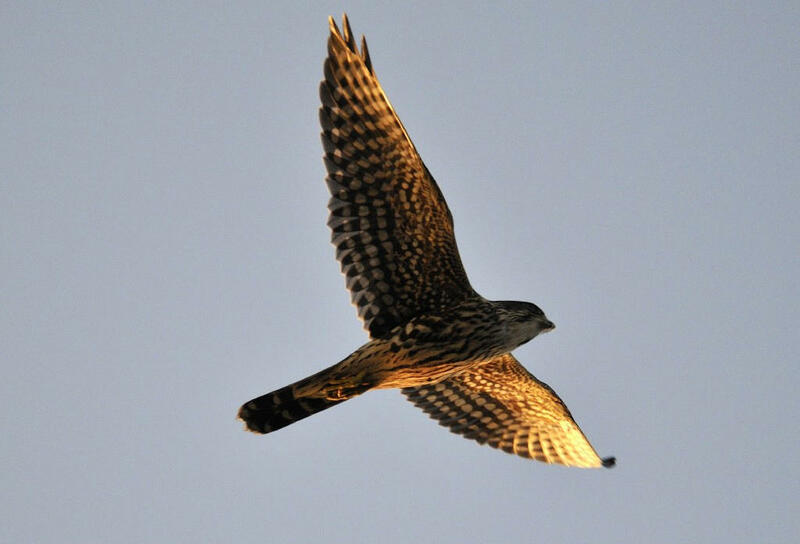 Saunders says the merlin population has been on the rise in recent years. “Merlins nest in trees, so if they’re nesting on a beach where there’s a treeline pretty close to the water, the main source of prey for the merlins and their growing family during the summer is going to be the shorebirds that are nesting on that beach, which often happens to be piping plovers,” she says. Merlins eat adult plovers. Gulls, crows, and raccoons like to eat plovers too. Habitat loss is also a main threat to plovers – people like to build on the same beaches where plovers need to nest. And Saunders says the higher water levels in the Great Lakes in recent years have led to less beachfront for the birds to build nests on. Elise Zipkin is an assistant professor at MSU, and she’s a co-author of the study. She says they were able to pinpoint merlin predation as one of the biggest threats to plover recovery. 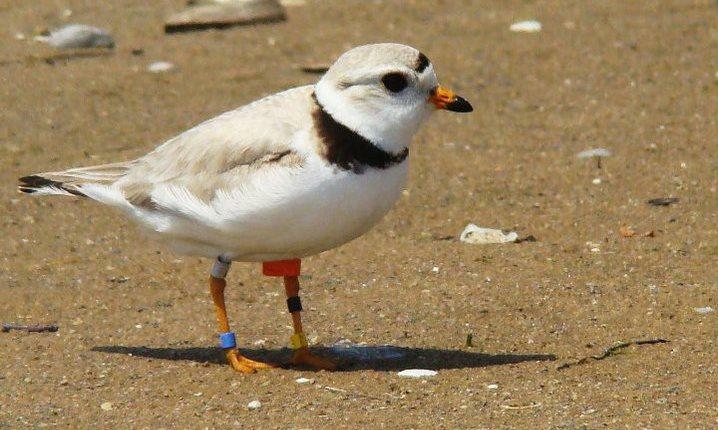 “Basically, if the merlin population continues to grow in the next ten years the way it has been growing, then we might expect to see negative effects on the piping plovers in the Great Lakes,” says Zipkin. The federal recovery goal for the piping plovers in our region is 150 breeding pairs. Saunders says when they ran their model without taking merlin predation into account, the plover population was projected to grow to 91 breeding pairs by 2026. But with merlins taken into account, the model predicted the plover population could drop to about 67 pairs. Sarah Saunders says wildlife managers need to pay more attention to merlins. “My recommendation would be to continuously adapt management going forward. Each year, re-evaluate not only what the piping plover population is doing but also what the main predator populations are doing including merlins,” she says. And Saunders says the rest of us can help too, when we’re on the beach at Sleeping Bear. That means following the signs and staying away from nesting plovers. “To keep your dogs on a leash is really important just so they don’t disturb the birds and get ahold of a chick that’s not able to fly yet,” she says. The U.S. 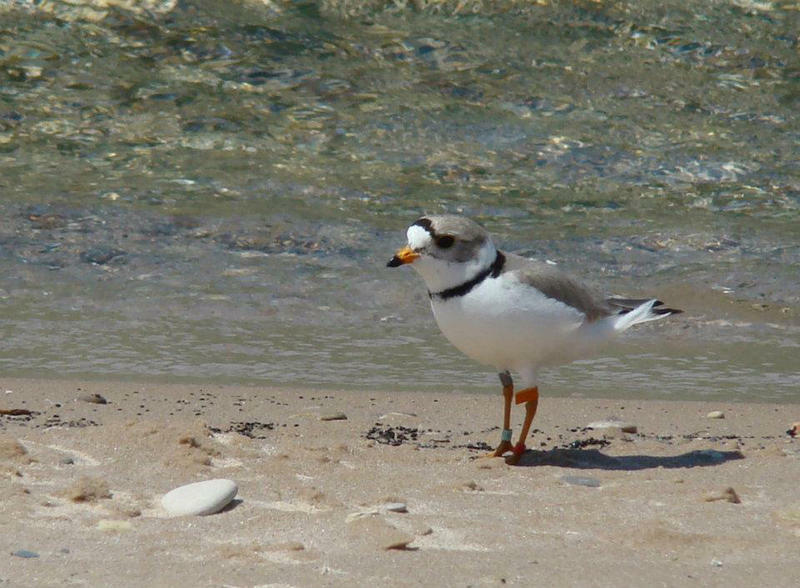 Fish and Wildlife Service is the main agency in charge of managing piping plovers. The agency provided some funding for the study. Vince Cavalieri is a biologist and the Great Lakes Piping Plover Coordinator with the Fish and Wildlife Service. He says the findings of the study are helpful. He says they've been doing a couple of different things to keep merlins in check. “We’ve had a non-lethal control effort where we’ve worked with the Michigan Hawking Club to actually go out and capture merlins at certain locations and then they were allowed to keep those birds in some cases as a falconry bird," says Cavalieri. "We also work with USDA Wildlife Services to do some control efforts to do some lethal controls, including shooting the merlins in some cases." He says the current merlin control efforts target 10 to 12 birds in a season. "So it’s a relatively low number. We don’t ever anticipate trying to decrease the overall merlin population. This is just a very targeted effort trying to give the plovers a chance to successfully breed and move on to the wintering grounds," he says. In this case, the agency is faced with a conundrum of sorts: controlling one native bird to help another survive. "The anthropogenic changes to the Great Lakes – and much of the country – are so great that I think, unfortunately, in some cases we really need to step in. If we want to keep animals like the piping plover around, we have to make some choices about what we want to manage for," he says. "I think Great Lakes piping plovers are a very interesting part of our Great Lakes natural heritage, and I think a lot of people would like to keep them around, so we’re going to have to manage merlins and other predators in order to do that." Cavalieri says they're always looking for volunteers to help out with plover recovery efforts. You can learn more here.